2011 has been a remarkable year, thanks to the movement of cosmic factors over sensitive points in the zodiac. Now 2012 looks to be more of the same! In this article, astrologer Rob Tillett discusses the transit of King Neptune, Lord of the Sea into Pisces, the sign of the Fishes. This rare move from detached, intellectual Aquarius to mystical Pisces brings an intense new flavour to our lives, one that has not been felt in any of our lifetimes, since the last time this occurred was in 1847—more than a century and a half ago! Neptune, the planet of deception and spiritual enlightenment, rules the oppressed and abandoned: the misfits of society. On a higher level he rules visionaries, and those who are glamorous and charismatic. 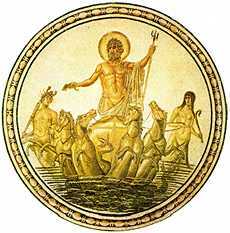 Neptune represents spirituality, mysticism, and ideals. The principle of Neptune is the dissolution of boundaries; as such it represents any energy or any person or any state of mind which does this. High Neptunian states of mind include receptivity, inspiration, and spirituality. People operating at this level will display sympathetic understanding, charity, and self-sacrifice. The lower levels include impressionability, delusion, and illusion. People operating at this level will display confusion, deception, and paranoia. Neptunian events are usually chaotic in nature and often bring misery, grief, and bereavement in their wake. A strong Neptune influence makes people prone to victimisation, either through their own actions and/or the actions of others, that is, through intoxication, self-undoing, suicide, or through, sedition, fraud, embezzlement, or bankruptcy. In terms of social activity, Neptune rules secrets, confidential matters, secret worries, work done in seclusion or in private, hidden things (the occult), imprisonment, and confinement. People ruled by Neptune are film actors, poets, dancers, ballet, photographers, mysterious persons, surrogates, spiritual counsellors, mediums, those who tend the sick or mentally ill, those who work with criminals or confined persons, those who work with liquids, drug addicts, alcoholics, slaves, orphans, frauds and spies. Other energies and things of a Neptunian nature are chaos, nebulousness, fading, diffusion, entropy, decay, merging and fusing, anything artificial, substitutes, fog, mist, the oceans, ships, gas, oil, liquids, chemicals, solvents, poisons, drugs. Horary Astrology: The History and Practice of Astro-Divination p 421. Neptune is the planet of delusion, deception, glamour and spiritual growth, while Pisces brings mystical submersion, sensitivity and idealism. Not a bad match, then, as modern theorists have surmised, suggesting Neptune replace Jupiter in the planetary hierarchy as ruler of Pisces. This is controversial (traditional astrologers do not accept that Neptune is the ruler of Pisces), but the occult affinity is there. This rare move from detached, intellectual Aquarius to mystical Pisces brings an intense new flavour to our lives, one that has not been felt in any of our lifetimes, since the last time this occurred was between 1847 and 1861—more than a century and a half ago! Neptune (as a planet!) is now in effect celebrating his first birthday—or rather anniversary of discovery. This time around, Neptune initially entered the Jupiter/Neptune ruled mutable water sign of Pisces on April 4, 2011, sort of slipping in the back way, as the main global attention has been focused on the warfare in the Middle East and the natural disasters associated with the ingress of Jupiter, Mars, Uranus, Sun et al into Aries, accompanied by the nodes changing sign from Capricorn/Cancer to Sagittarius/Gemini. But it was to be a short visit, as Neptune merely placed a toe into the Waters of Pisces, retreating into Aquarius again on August 5, 2011 to finish off old business. 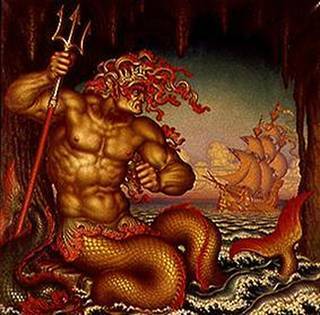 However, after several months of Neptune revisiting Aquarius, the Lord of the Sea is now heading back into Pisces for a very long stay, remaining there pretty much until January 2026 (with a short scouting venture into Aries between March 30, 2025 and September 22, 2025). Pisces gives a love of mysticism and a tendency to investigate metaphysics. We would like to see a positive spin on Neptune's influence, inclining people to be more compassionate towards others and laid-back in their manner. The subliminal power of Neptune will see aid that is cheerfully and willingly given to the less fortunate. It will certainly be needed! Social and religious forces will seek to influence governments and the powers that be. However, the negative side of Neptune is more likely to affect the majority of unawakened souls, who will suffer from obsession, and deception from secret enemies. The authorities are likely to try to hold back the tide by imprisoning their opponents, if not by brainwashing and propagandising them into obedient drug-addled slugs. Overindulgence in alcohol or drugs, whether imposed from without or craved from within, will end in sorrow and self-undoing. Strange schemes and secret enemies are likely to destroy those who allow themselves to fall under their influence. Neptune will be in Pisces for many years to come, so his influence won't be felt every day or even in terms of weeks or months unless one of the factors in your own personal chart is affected directly. From time to time, circumstances will announce the power, probably when you experience a much deeper interest in the occult and the paranormal. Higher levels of spiritual understanding and growth will seem within your grasp, but only too often snatched away. We must consciously avoid destructive emotions: indulging in self-pity, guilt, inadequacy and fear. These are the negative potentials of Neptune in Pisces. We may have difficulty in seeing or detecting those who wish us harm, but our intuition and sensitivity is heightened at these times, so we must learn to trust our hearts. Many will be drawn to explore the deeper side of life, working in secret religious or occult groups to attain mystical experience and paranormal powers. Governments and large institutions will also be inclined to carry on concealed experimentation in such seemingly off-the-wall directions as remote viewing, telepathic communication, psychokinesis and super-enhanced military forces. Talking out our fears and issues is likely to be less than productive, for we may not have a clear sense of exactly what the trouble is. It is better to concentrate on gaining greater spiritual or psychic growth under this transit. In the most positive instances, however, our instincts and intuition may be so heightened as to become a sort of ESP. To avoid the storm, seek the advice and guidance of trusted allies. No one needs to feel unnecessarily victimized. Those who are strongly affected may lead a more confined or isolated existence during this phase, or somehow become more involved with those who do. Monasteries, ashrams, asylums and prisons all seem to radiate a spiritual attraction—or perhaps a fated one! More positively, Neptune in Pisces will move many of us to selfless service, or self-sacrifice, on behalf of those who have been victimised. So, while Neptune's stay in Pisces will be characterised by mysterious, seemingly fantastic events in which large numbers of people suffer, such events can serve to unify a community or nation by bringing about a widespread outpouring of sensitivity, compassion, and/or spirituality in response to that suffering. Imagination and fantasy will come to the fore, especially in movies and media, 3D games, fashion and sexual expression. Many will seek to withdraw from society, taking up a religious, artistic, or possibly even hermetic existence. Society however, will be more inclined to care for its misfits. Even though Neptune does stimulate a deeper awareness, it is also inclined to produce delusion and deception, even fanaticism, religious mania and mass hysteria. Mass delusions can take hold of affected societies, such as for example the Tulip Mania of the 1600's, or the South Sea Bubble of the 1700's, the Witch Mania of the Inquisition, Social Revolution, Anti-Semitism, McCarthyism, or more recently the DotCom bubble and the Financial Boom (and Bust) in the past decade. Some believe that Neptune's move into Pisces will mark a phase that features more personal fulfilment, through the abandonment of the ego, the use of imagination and selfless caring for others, along with a less selfish abuse of the world's resources. Perhaps even a time of spiritual awakening. This is an unduly hopeful view of a phase that will surely be more emotional, because emotions tend to be unconscious motivators, which Neptune as a massive subliminal force is sure to be. The mass mind, or collective unconscious, tends to react blindly, rather than consciously, and so expresses the fears and delusions, rather than the higher expressions of a sacred path. As things associated with Neptune are likely to become stronger and more resonant during this phase, we need to gird up our loins in order to deal with natural factors that are likely to be experienced as destructive. "...as Neptune enters Pisces, we can expect everything associated with Neptune to become stronger, more apparent and more of a dichotomy. And since Neptune’s symbolism ranges from the watery depths of the ocean and our emotionalism to Neptune’s famously intoxifying qualities (fantasy, addiction, denial, abandonment, ecstasy, loss, expectation, idealization, imagination) to Neptune’s connections to all things toxic, dissipating and dissolute as well as all things curative and healing… Let’s just say things are going to be challenging. Yet through our challenges we are likely to become more connected to (or reconnected with) the best of nature—human and otherwise. It’s just not going to happen where we want it to happen. That’s the Neptunian precept. What we think most likely will turn out to be the dream… that we think least likely will in the end prove true." Boots Hart also points out that as Neptune now enters the sign of its greatest potency, the Age of Pisces is on the way out. Things that our society have taken as given over the past 2,000 years or so are encountering a shift of dynamic, an essential purification. 2011 has already given us a foretaste. Many great evils will emerge during this phase, and in order for us to overcome them, we first need to purge them from our souls. As I said in my article on Astrology, Destiny and Intent, we cannot step outside a transit any more than we can step outside the atmosphere, but we can harness the energy through skilful means and turn it into something valuable. Astrology helps us to be objective about these problematic circumstances, but also can guide us to times when personal action is most likely to succeed. A deep understanding of astrology is like opening a doorway into the meaning of life, an initiation into the secrets of the world. It's a beautiful thing!